An artist in China. A bureaucrat in Canada. On the surface, these pairs appear significantly different. But are they? Recently separated from Gary, Wendy takes off to China, looking for a transcendent experience. She falls in with two performance artists and has to struggle with questions of artistic praxis, cultural difference and mental health. Then a government anti-corruption campaign targets one of her new colleagues. Shuffling bureaucrat Gary remains in Victoria, BC, stuck in his cubicle at the Ministry of Wellness. He discovers suppressed research about an anti-anxiety medication, a drug his bosses want to approve for funding. He could reveal all and commit career suicide. Or the revelations could make him a hero. 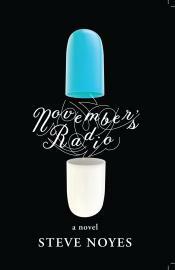 November’s Radio draws subtle parallels between China and Canada: both teem with political minefields, neurotic misfits, and styles of corruption. Noyes spins both yarns with keen wit and poetic language, guiding his characters—and the reader—through a maze of conceit and greed. This is a world run amok.